Preheat the oven to 425 degrees F and position an oven rack in the lowest position. Line a baking sheet with parchment paper and lay flat 1 sheet of thawed puff pastry in the center of the pan. In a small bowl, beat lightly 1 egg and brush the entire puff pastry with the beaten egg. Fold all the edges inward to make a boarder about ½ inch wide and press lightly to adhere itself. Brush the newly exposed pastry with the lightly beaten egg. Take a small knife and score the outside width of the folded rim so the boarder will rise during baking. Very lightly score the inside perimeter to also promote the outside edges to rise. Using a fork, poke several holes in the center to allow air to escape during baking. Sprinkle ½ cup of the parmesan cheese in the center but don’t allow cheese to sprinkle on the boarder. Bake for 15 minutes to help the crust crisp and a crust to form and rise. Remove from the oven and cool on wire rack until room temperature. Meanwhile slice the tomatoes and lay the slices on paper towels single file. Sprinkle with 1 tsp of kosher salt to help wick the moisture out of the tomatoes and cover with more sheets of paper towels over the top. Pat gently on the paper towel to absorb the moisture and let sit for 30 minutes while the tart shell cools. 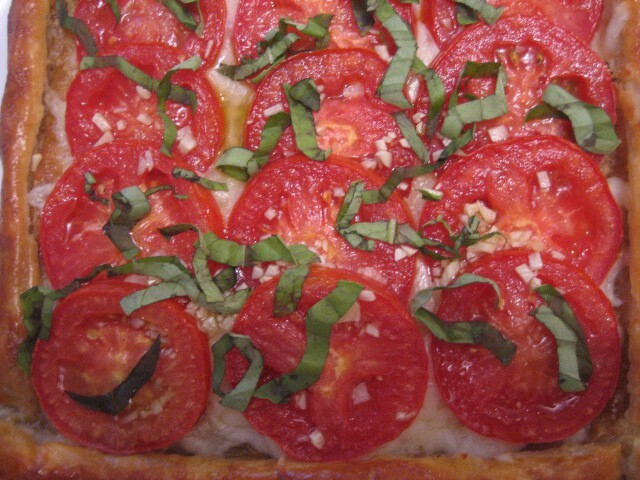 Once the tart has cooled to room temperature sprinkle the shredded mozzarella over the baked parmesan cheese and then “shingle” the wicked dry tomato slices in three rows on top of the mozzarella cheese. Then brush the minced garlic/oil mixture using a pastry brush over the tomatoes and season with fresh ground black pepper. Return the tart to a baking sheet lined with parchment paper and bake again for another 10 to 15 minutes. 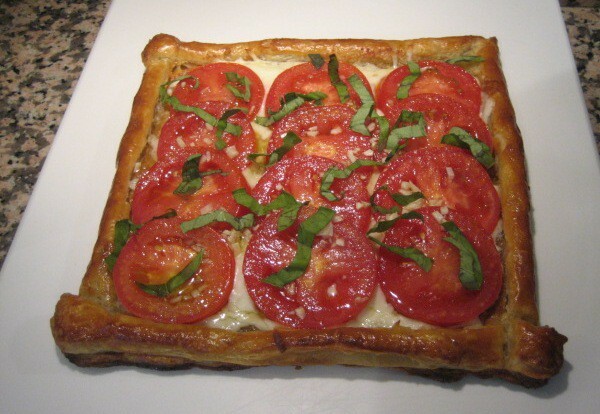 Remove from the tart from the oven and garnish with the julienned basil and serve warm.